rogue poags: Southern Maryland Blue Crabs: our hometown team! Southern Maryland Blue Crabs: our hometown team! 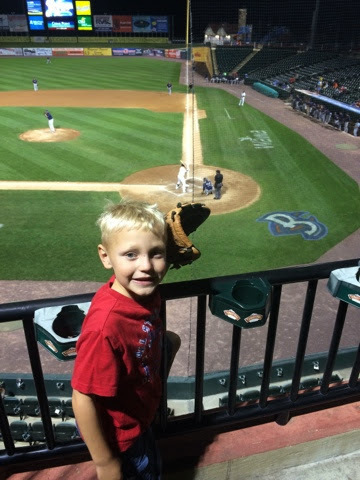 The boys and I were invited by St. Charles Maryland to visit our hometown baseball team, the Southern Maryland Blue Crabs for the Tuesday night game against the Somerset Patriots. We have visited Regency Furniture Stadium in the past, but never had the luxury of sitting in a suite! The St. Charles Suit was so nice and had plenty of space for our little kids to run around in! Not to mention, the best view in the house! We were located directly above and behind home plate which means we had views of our team, the opposing team and the entire field! The St. Charles suite is available for anyone to rent! 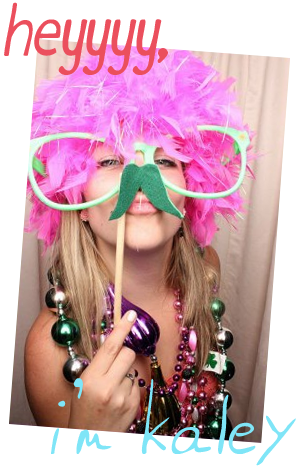 At only $400, which includes 25 tickets + food and drink, it is very affordable for your next birthday party or company event! Contact a representative today! The night was off to a great start with the Patriots only scoring one run in the first and the Blue Crabs quickly firing back to even the score in the 2nd. It was a quiet 3rd inning but the Patriots scored another run in the 4th bringing us to a 2-1 game. It remained that way until the 9th inning when the Patriots scored twice. The Blue Crabs gave the fans an exciting bottom of the 9th, but fell short with a final score of 4-3. Despite the loss, moral was still super high in the stadium. Thats one thing that I love about Southern Maryland, we support our team WIN or LOSE! Then there is Ron, the Tye-Dye Guy who helps keep spirits high around the stadium! He keeps the crowd entertained and engages with almost everyone at the stadium. It really gives you that 'hometown' feeling! He talks to you as if he's known you for years and can make anyone laugh! Aside from the baseball, there is Pinch the Blue Crabs Mascot. 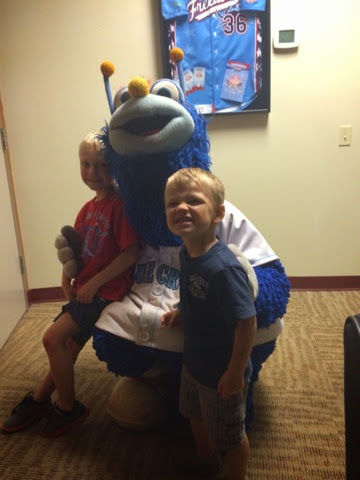 My kids love to look around the stadium and find him, because there is no way you can miss the big, blue crab! We were so lucky to have Pinch come to our suite and say hello to the kids! If really made their night! You can catch Pinch just about anywhere in the stadium and he's always willing to stop and take pictures with fans of all ages. I've said it before and i'm saying it again - it really is SO nice to have a baseball team so close to home! The tickets are affordable, starting at just $8.00 and there isn't a bad seat in the house. Not to mention - kids under 5 are FREE! If you happen to catch a Friday or Saturday evening game, be sure to stick around for the firework display which takes place after the game! Crabby Cove: Jump on a bumper boat (that are all equipped with built in water guns) and cool off on a super hot day! Backfin Buddies Kids Club: For $15.00, kids can join and receive a free field level ticket to every Sunday game, Pinch swag and exclusive promotions and discounts! PNC Kid Zone: Bounce House, Rock Wall and Playground for all kids! Great Food and Beer: In addition to Hotdogs, Hamburgers and Chicken Tenders; the Stadium, of course, offers CRAB CAKES! You can also find Blue Crabs Lager there, which is exclusive to Regency Stadium! Special Events: The Blue Crabs are always working with local businesses for special nights. Be sure to check the event calendars when purchasing tickets! Be sure to get connected with the Southern Maryland Blue Crabs via Facebook, Twitter, Instagram and even YouTube!